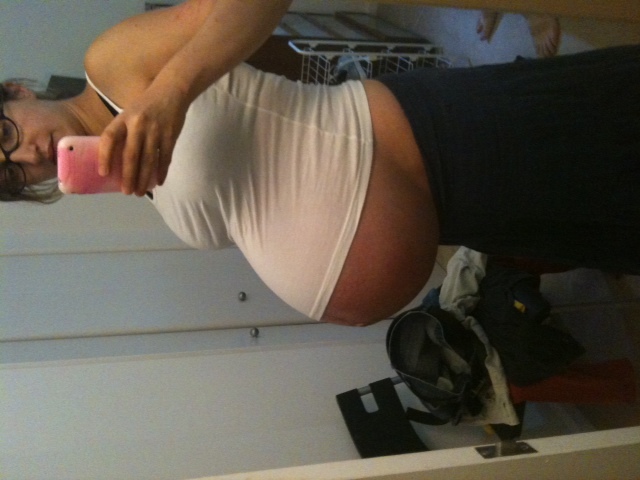 Yippee we made it to 35 weeks! High fives all round. Last week was pretty tough. My evil, itchy PUPPPS rash* was still in full force and had spread from my abdomen down to my toes and was starting to invade my arms and hands. My shins were bright red as the rash joined up to form one big angry mess. I could actually see the rash spreading in front of my eyes. It was pretty freaky stuff, and I was waking up in the middle of the night to find myself scratching myself red raw in my sleep. When you couple this ugly assed rash with an increasing sense of isolation as I hadn’t seen friends in a couple of weeks I was turning into one of those zoo animals that pace their cage and bite their keepers. Then last Friday the rash on my abdomen started to look like it was clearing up. 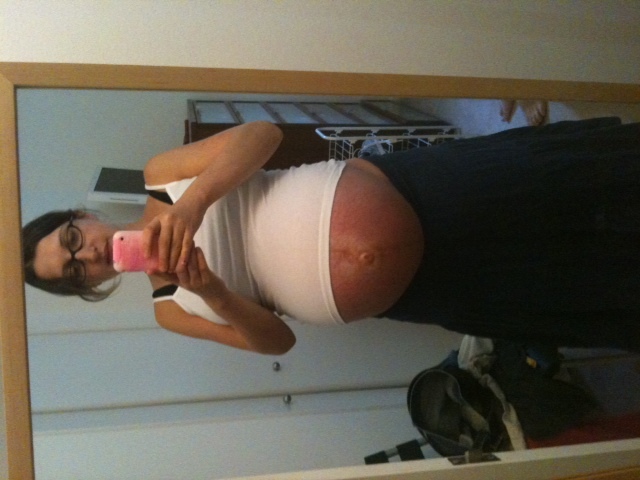 Of course when I showed it to my OBGYN she was somewhat taken a back – even when I told her this was it “getting better”. She started to talk about moving my c-section to 37 weeks if the rash continued and wanted me to see my dermatologist. This made me feel like a bit of a failure. I’ve worked so hard to keep the Cylons safe. Taken things so easy to the point of frustration. I’m an active person so not being even able to take out my own trash for most of this year or work out or travel or even stand for long periods of time has been tough. 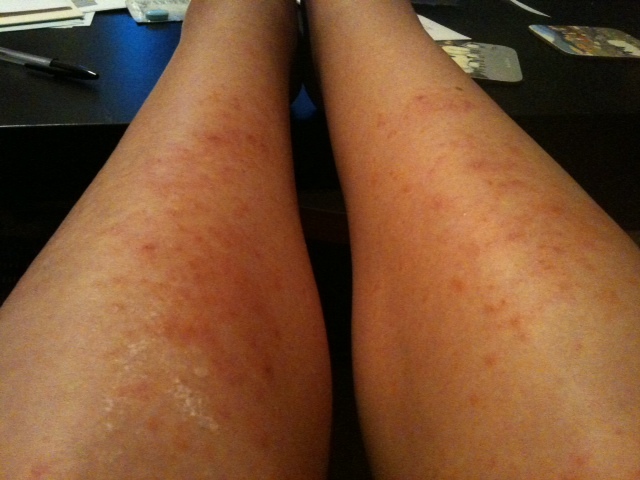 Over the last few days the rash has pretty much gone from my belly, and has started to fade on my legs. The intense itching has pretty much been reduced to an everyday pregnancy itch. I’m still going to my dermatologists tomorrow just in case it flares up again but the worst of this PUPPPS outbreak appears to be behind me. Woo fraking hoo! Just as an FYI the best relief I got from it was an ice-pack though I didn’t use that on my belly for obvious reasons. Then today we had our 35 week scan at the hospital, and the Cylons are measuring so well (even with the 15% margin of error). Cylon A is 5lbs 5ozs, and Cylon B a chubb-tastic 6lbs. B is still breech so c-section is still on. I’ve got my first non-stress test** on Thursday then a regular OBGYN appointment on Friday. It’s the week of doctor appointments. I have a feeling that my c-date is something that is going to be reviewed on a week-by-week basis but fingers crossed we can all make it through the next 21 days. *Always reassuring to having something with ‘Plague’ in the name. **I can’t see the Cylons responding well to the non-stress test if they are poked and buzzed! We might see lasers being shot out of my belly.